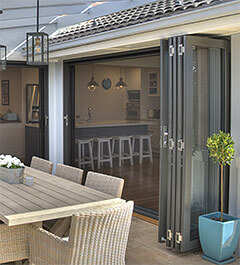 A premium solution for those seeking superior functionality and style in the alfresco area of their home. 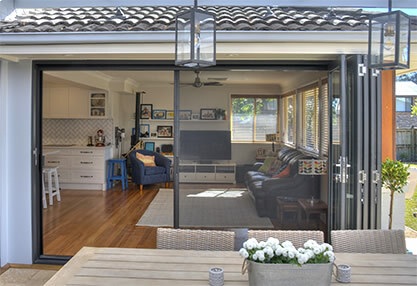 The Carinya Select Top and Bottom Bi-Fold System features flat sill options for smooth accessibility and optional mid rails with multi-point locking in a range of opening configurations. For a modern designer look, the Carinya Bi-Fold extrusions are a consistent 85mm wide face on both the stiles and rails. This allows a balanced visual face and allows a vast array of hardware lock options. Combined with commercial grade spigots, these door panels are superior in strength and performance. The Bottom rolling Bi-Fold system features the innovative F2/F3 Centor Bottom rolling hardware which overcomes the requirement for any structural beam as needed in a top hung Bi Fold system. This is ideal for the new or renovation market that want an Alfresco style opening without the additional cost of a structural beam. The Top rolling Bi-Fold system features the Alspec commercial grade E2A Centor rolling hardware which has been used and proven over time in commercial projects. 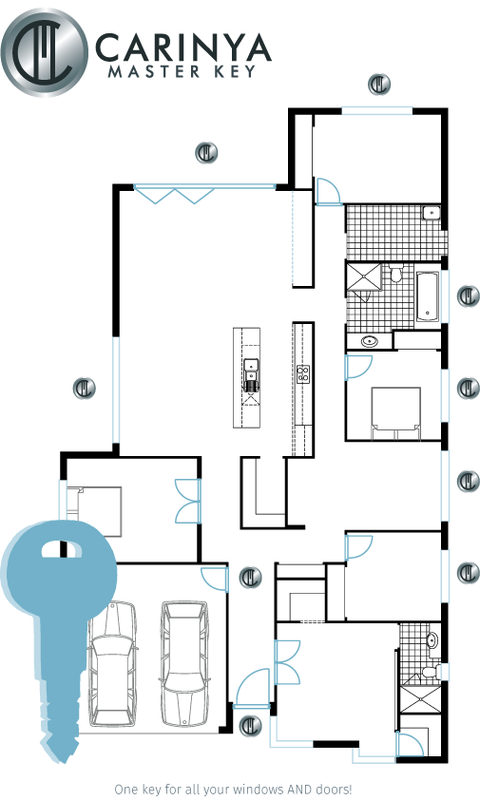 This is ideal for the new construction market that want an Alfresco style opening. 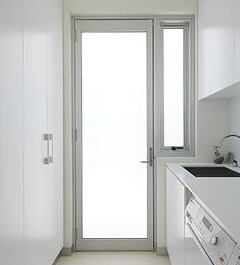 The Carinya attention to detail includes concealed flush bolt brackets, reducing visible fixings, as well as custom extrusion design allowing for clean interaction with door hardware. The Centor hardware is of the highest quality which is backed by a 10 year warranty. 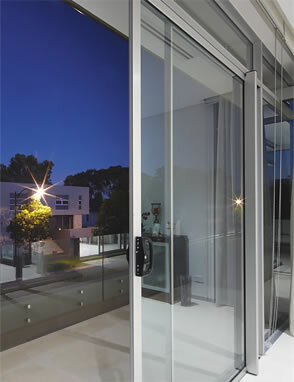 The Carinya Select Bi-Fold Door has been designed with hardware from the start, not as an after thought. All locks and flush bolts blend seamlessly with the custom extrusion for a professional finish. The sashes feature a commercial door spigot, allowing a strong and robust panel for enduring use making the panel free of twist and movement. Standard lock hardware options include Alspec's custom Australian made Killara Furniture, combined with Lockwood’s proven Optimum mortice lock. Fitting snug within the stile and allowing an extended backset, this lock removes the common issue of minimal key distance to the jamb. Other lock options include commercial locksets and furniture for a complete choice, as well as two and four point locking on the active leaf panels. Custom flush bolt guides have been designed to remove visible fixings from the extrusion faces, allowing a tighter integrated sealing saving potential energy costs while giving a professional, uninterrupted clean visible surface. Killara Xtra Furniture allows for an internal snib option with lock indicator and two or four point locking for all configurations. 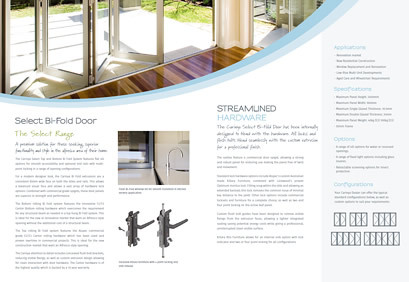 Our Carinya Dealers are pleased to offer a solution for multiple keys for your doors and windows. It is possible to have 1 key for your front door, french door, bi-fold door, sliding window, awning winder and security screen door. With Carinya's Master Key there's less keys... and less fuss! 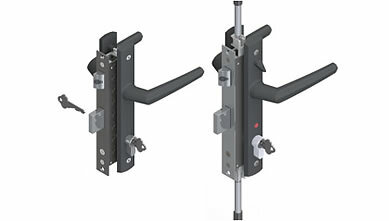 Using the Centor S1E system allows for the screen to be completely retractable into the door jamb when not in use. The mesh is sheer, and there are no grills or horizontal bars to detract from the view. The screen is barely noticeable when in use and disappears when you don’t need it. 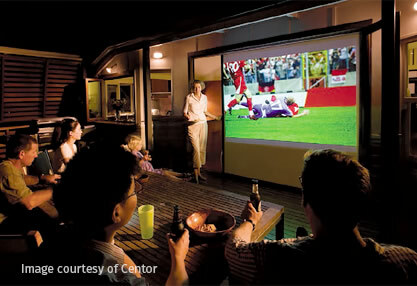 The screen is made from a hardwearing polyester/PVC material that can withstand damage from pets. Tight Technology™ ensures the screen remains straight and tight across the widest spans. The screen can be opened and shut from any height on the stile, so even small children can operate it. With no crude spring loading to fight against, the screen remains firmly in any chosen position across the opening. This is due to the use of Centor’s patent pending Load Balancing Technology™. These screens are tough enough to withstand real-life use, backed by a five-year warranty. Exhaustive cycle testing to 400,000 cycles, and exposure to dust, mud, sand and salt spray ensure reliable operation well beyond its five year warranty. Your Carinya Dealer can offer the typical standard configurations below, as well as custom options to suit your requirements. 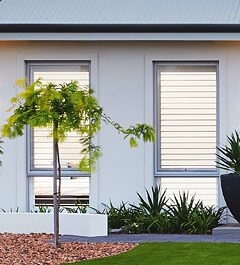 Depending on the look require, you have many colour options for your Carinya Windows and Doors. Your Carinya Dealer can help you through this process of selecting a prefect match to your project. A tough and durable option allowing for a wide range of colours. Finishing is provided by supplier accredited Alspec branches, as well as selected quality contractors. Warranties are available. Depending on your finish option, you will receive a warranty ranging from 7 years (film and colour integrity) to 15 years (film and colour integrity). Now you can install green, green glass at home - with designer style! The Carinya Collection of aluminium framed windows and doors has been specifically designed to be environmentally friendly, reflecting Carinya's commercial market heritage, where thermal and acoustic performance are often critical. Of all building materials including glass, timber and masonry only one material is 100% recyclable - Aluminium. 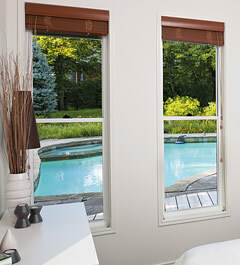 Windows and doors are vital to the energy efficiency of any home. Research by the Sustainable Windows Alliance of Australia shows the typical Australian home can achieve an increase of 2 to 2.5 stars energy efficiency simply by upgrading the windows. 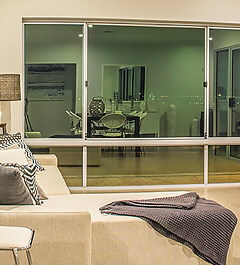 Unlike many aluminium windows, Carinya has been designed for all major forms of eco-friendly glazing options without any alteration to the frame or any unsightly add-ons. 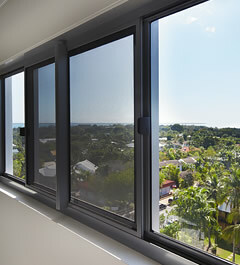 Carinya frames are designed for eco-friendly Low E glass, high thermal and high acoustic performance 10.5mm glazing. To maximise the energy efficiency of your glazing discuss your project with a specialist Carinya Dealer and/or your architect or designer. Orientation - always try and have living areas facing north with seasonal shading. The Housing Industry Association of Australia (HIA) strongly suggests you ensure the energy rating on your windows is WERS rated to be confident of its true performance. 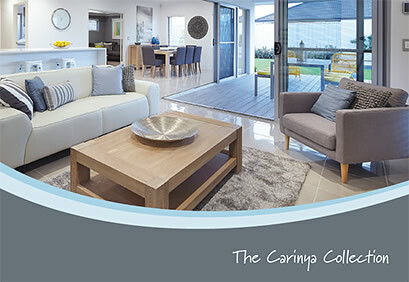 Carinya gives you that confidence as the entire Carinya Collection has been WERS rated for performance. 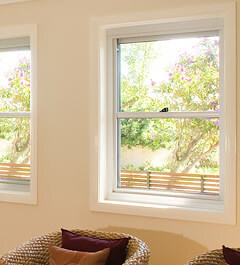 WERS stands for the Window Energy Rating Scheme that is managed by the Australian Window Association. WERS enables windows to be rated and labelled for their annual energy impact on a whole house, in any climate of Australia. WERS acts as a fair, rigorous and credible system for testing energy performance claims. It is about certified performance. Energy rating for windows is here to stay as part of the federal government’s commitment to improving energy efficiency and reducing greenhouse gas emissions. 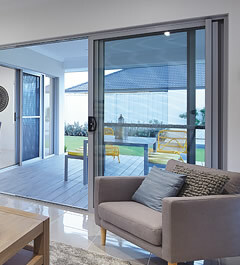 The flexible glazing options available in The Carinya Collection means that our windows and doors compare favourably in WERS performance and the resale value and comfort of your home are improved by the use of the high performance Carinya windows and doors.